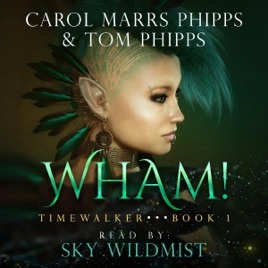 From husband and wife writing team Carol Marrs Phipps and Tom Phipps, Wham! is an imaginative and original dystopian fantasy where technology and magic stand side by side. When Children and Family Assistance police drag her mom, her dad, and her beautiful sister out the door into the night and beat her senseless, Tess Greenwood finds herself alone, her every move watched by the hidden World Alliance. Almost blind after her beating, she flees to the forbidden Broadstreet compound and a troll named Maxi. So begins Tess' journey from quiet teen at home to fierce young woman determined to get back her family any way she can. Even if she must travel time itself. Frantic, Tess tries to pull herself together to save her loved ones and her world...and the clock is ticking.